As Dr. Will Caster works toward his goal of creating an omniscient, sentient machine, a radical anti-technology organization fights to prevent him from establishing a world where computers can transcend the abilities of the human brain. So, my expectations for this film have gone from extremely high (due to Wally Pfister’s great cinematography work with Christopher Nolan, and a good cast and sci-fi premise) to fairly subdued (a terrible trailer campaign that not only seemed to give away the plot, but managed to ruin the allure, and a hefty critical panning) but I was pleased that this turned out to actually be a really good sci-fi film. It takes the idea of self-aware machines, a central premise that has been done to death in sci-fi films, but manages to put a fresh spin on it and create a story that isn’t only thrilling, but is also romantically involving. The story focuses primarily on Dr Will. Caster (Johnny Depp), a researcher focused on artificial intelligence and the idea of machines as sentient beings (an idea he refers to as Transcendence), his wife (Rebecca Hall) and colleagues (Paul Bettany, Morgan Freeman). Things kick into gear fairly early on, when a terrorist group attack several research facilities and attempts to assassinate Caster, initially not fatally, but it becomes so due to radioactive material in the bullet (which only makes sense from a storytelling perspective, but hey ho, we’ll let that go). The trailers were fairly clear that the story involves Caster’s consciousness being uploaded to a machine, and the central conflict involves the ‘machine’ becoming more powerful throughout the course of the film. Like many great sci-fi films, the narrative poses interesting questions about what it means to be human and about the extraordinary power of machines. Whilst the aspect of powerful machines is nothing new, the romance aspect between the machine version of Caster and his wife is fairly fresh (despite ‘Her‘ earlier this year) and this adds a greater level of depth to the film thanks to excellent performances from Depp and Hall. Depp is great in a ‘straighter’ role following various turns as crazed weirdo’s in a variety of Tim Burton films and the Pirates of the Caribbean series, but it’s Hall who steals the plaudits, strongly depicting her characters inner conflict as she struggles to marry up her love for her husband, and the danger posed by the new situation. The supporting cast is strong as well, filled with great actors such as Bettany, Freeman, Kate Mara and Cillian Murphy. As you would expect from Pfister’s cinematography background, the film is a visual treat, and the sequences involving effects truly stand out. The difficulties perhaps comes with the narrative, which initially struggles to generate momentum but it does click into gear as we approach the third act, which is very strong, albeit I could have done without the final 5 minutes which seemed to put too fine a point on the film’s main themes. 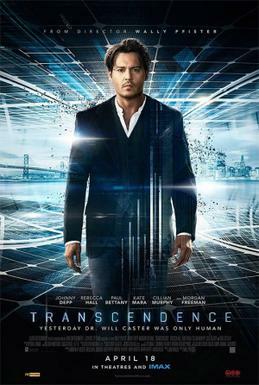 Overall though, this is an intelligent and well intentioned piece of sci-fi and I’d urge anyone reading this not to let the critical lashing put you off – Transcendence isn’t perfect but there’s a great deal to enjoy here. Starring: Johnny Depp, Rebecca Hall, Paul Bettany, Cillian Murphy, Kate Mara and Clifton Collins Jr.